Alas, those hopes prove to be in vain, because the muddled “Onegin’’ does none of the above. 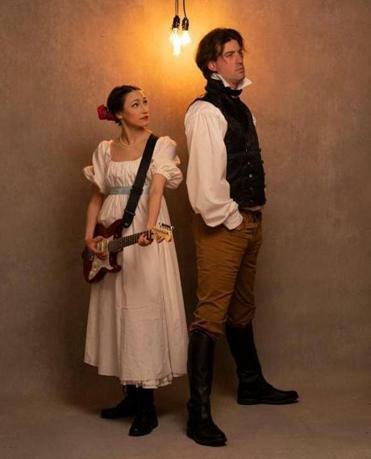 After sitting through the US premiere of “Onegin’’ at Greater Boston Stage Company, directed by Weylin Symes, I still don’t have a clear idea what this musical is trying to be (apart from, perhaps, a pale simulacrum of the far superior “Natasha, Pierre, & The Great Comet of 1812’’). I suspect the creators of “Onegin,’’ Amiel Gladstone and Veda Hille, aren’t certain, either. Are we meant to experience “Onegin’’ as an impassioned story of love (a word that appears scores of times in Gladstone and Hille’s libretto), class, freedom, friendship gone awry, and the unpredictable workings of fate? Or as a winking sendup intent on swaddling that 19th-century tale in contemporary snark? Or as an earnest homage to the pair of Russian titans behind the 1833 novel-in-verse and the 1879 opera? Or as a meta-theatrical quasi-cabaret experiment in fourth-wall-breaking? At various points, “Onegin’’ is each of those things, but the whole adds up to much less than the sum of its parts. Granted, it would be foolish to insist upon tonal consistency in any stage work, given how many productions successfully juggle drama and comedy or toggle smoothly between present and past. But there’s a randomness to the mood swings and stylistic swerves in “Onegin,’’ a largely sung-through musical that premiered in Vancouver in 2016 and was produced in Toronto a year later. In Stoneham, the production is further hobbled by the significant variation in the caliber of singing by Symes’s cast. Moreover, when a show is already rife with moments that don’t land, it is extremely ill-advised for a script to require, as “Onegin” ’s does, that cast members engage in self-conscious interactions with the audience. “Onegin’’ virtually grinds to a halt as performers pepper the crowd with such pseudo-banter as “Who’s in love? Who’s on a date? Are you having a good time?’’ or take selfies onstage. Those artificial interactions don’t just lay an egg; they seem to throw the cast off-stride. Mark Linehan delivers an unconvincing performance as Evgeni Onegin, a love-’em-and-leave-’em dandy who carelessly toys with the hearts of two rural sisters and destroys the dream of his good friend. Physically, the strapping and luxuriantly maned Linehan looks the part of Onegin, and like the rest of the cast he has been handsomely costumed by designer Deirdre Gerrard. But the actor lacks the vocal chops to adequately sing the lead role, or at least he did at the performance I attended — a shortcoming that helps to make the forgettable score of “Onegin’’ even more so. As the musical begins, it is 1819, in St. Petersburg, where Onegin’s friend and fellow member of the Russian gentry, Vladimir Lensky (Michael Jennings Mahoney), has fallen in love with Olga Larin (Josephine Moshiri Elwood, who impressively doubles as a violinist). At first Onegin cast his roving eye on Olga’s older sister, Tatyana (Sarah Pothier). But after Tatyana falls for him and confesses as much in a letter to him, Onegin informs her he is not made for marriage. A bright spot in a supporting role is Kerry A. Dowling, who displays her usual vibrancy as the mother of Tatyana and Olga. But Peter S. Adams makes little impression as a prince who delivers a surprise to Onegin in Act Two, and the normally solid Christopher Chew seems marooned in the role of a foppish Frenchman. There’s a moment right after intermission that encapsulates the flawed dramaturgy of “Onegin,’’ when the note of high-stakes dramatic tension on which Act One ends is promptly dissipated by a jokey start to Act Two. It’s yet another meta-touch that takes the audience out of the story, with Mahoney, as Vladimir, saying: “Welcome back. We’re going to keep going, if you don’t mind.’’ It was probably smart of him to not put the matter to a vote.